Right, so what's the point of the Lincoln Navigator? Set to go on sale in dealerships this fall, the 2018 Ford Expedition is all-new, built on the same platform underpinning the current F-150 full-size pickup truck. The Expedition also shares the F-150’s lightweight aluminum body panels. However, we haven’t received pricing details. Cars Direct has uncovered that information, however, and it’s quite surprising. The base Expedition XLT will begin at $52,890 with destination. The Expedition Max, the replacement for the extended length EL, starts at $55,580. Adding all-wheel drive will be an extra $3,000. The off-road focused Expedition FX4 begins at $63,155. Now, here’s where things start getting expensive. 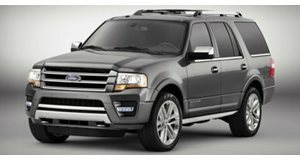 The Expedition Limited begins at $63,780, an increase of $6,540 over the outgoing model. This price increase trend continues. A new Expedition Platinum will set you back at least $73,905, an $8,505 increase over the current model. The most expensive 2018 Expedition will begin at $79,740 for the Expedition Platinum Max 4x4. Just to compare, the also all-new Lincoln Navigator begins at $72,055 and a fully loaded Black Label will just cross the $100k mark. But still, there’s little price difference between the Expedition Platinum and the base Navigator, leading us to ask this: Is the Expedition Platinum necessary, or is the Navigator itself not needed at all? Maybe by this time next year we'll have an answer based on first year sales figures.